The former Navy SEAL who wrote a book with a firsthand account of the Osama bin Laden raid is quickly stirring up controversy, and could face criminal charges if the book reveals classified secrets. 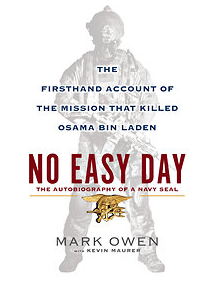 Defense officials said the book, No Easy Day, written by an anonymous former SEAL under the pseudonym Mark Owen, was not reviewed by anyone at the Pentagon. One defense official told The Hill that the Pentagon has requested a copy for review, citing DOD directives that require review by former military officers who publish material that could contain classified information. The author could face criminal charges if the book reveals classified information. The official said, however, that it would be the Justice Department, not the Pentagon, that would decide whether to investigate and prosecute the author for revealing national security secrets, because the author is no longer on active duty. A release from Dutton, the book’s publisher, on Wednesday said the book’s author was one of the first SEALs through the door on the third floor of bin Laden’s Abbottabad complex and witnessed the terrorist leader's death. “It is time to set the record straight about one of the most important missions in U.S. military history,” Owen writes, according to the release. Dutton says the book, co-written by author Kevin Mauer, who was embedded with troops in Afghanistan, has been vetted by a special-operations lawyer. But one secret in the book has already been outed less than 24 hours after the book’s existence was reported: the author’s identity. Fox News first reported Thursday the name of the SEAL who has reportedly written the book, and The Associated Press wrote a story confirming his identity, both citing anonymous U.S. officials. A statement from Dutton after the Fox report urged media organizations not to release the author’s identity.